If you’ve ever looked at the interior of your air conditioner, you may have noticed frost or ice building up on the coils. It may not seem like a big deal and in fact can make a certain amount of sense. After all, air conditioners are supposed to be cold. Why wouldn’t there be a little frost or ice built up? Unfortunately, that assumption is wrong. Frost on the coils is a sign of significant problems with the system and usually requires the services of a trained technician to correct. The evaporator coils are the centerpiece of the air conditioning system: the part that actually cools the air. Liquid refrigerant enters the coils under a great deal of pressure. There, it expands into a gas — which it achieves by pulling heat from the air around the coils. The cool air can then be blown into the home with a fan. But when ice or frost forms on the coils, it forms a barrier between the refrigerant and the air it’s trying to cool. As a result, the air conditioner has to work harder to do its job, which raises both the cost of running the system and the strain on other components. Even worse, it usually leads to more ice forming on the coils, which only makes the issue worse. Eventually, it will cause a breakdown, though its efficiency will often drop precipitously until then. Low Refrigerant Levels. 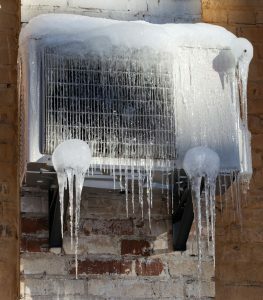 Refrigerant leaks will throw off the delicate balance required to cool the air and create frost. In some cases, it can also be caused by other problems in the system keeping the refrigerant from cycling. Fan Problems. If the fan can’t blow cool air into the duct system, the lowering temperature will increase the amount of frost and ice on the coils. Blockages. If a filter is clogged or these a blockage in the system somewhere, it will similarly keep the cool air from moving out of the system, increasing the ice on the coils. Why Not Just Scrape It Off? Scraping the ice off may sound like a good idea, but in fact, it might be the worst thing you can do to address the problem. In the first place, it won’t actually solve the problem. The ice will just reform soon thereafter. Furthermore, there’s a very good chance that you could damage the coils in the process. Cleaning a dirty filter or sealing a refrigerant leak is a moderately inexpensive process, but replacing the coil adds a tremendous amount of cost and effort to the job. If you spot frost on the coils, turn the system off and call in a repair service immediately. For AC repair services in Glendale, CA, call Greenleaf Heating & Cooling today!